Step 1 – Analyze the list. Four continents begin with the letter “A”. 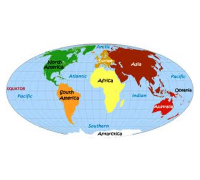 Two other continents begin with “A” but have a “North” or “South” in front of them. One continent begins with an “E”. Step 2 – Visualize and make up a story. To remember the four “A” continents, visualize a lion in Africa leaping down to Antarctica where it’s cold. A penguin jumps on the lion’s back and off they fly to Australia and pick up a koala bear who wants to see a panda in Asia. Draw a picture of the animals, showing the names of the continents. Step 3 – What “A”s are left? The other two “A”s are for North America and South America which are easy to remember. Step 4 – The easy “E”. That just leaves the “E” continent which is Europe. See how easy it is to remember. Stories are powerful visuals when you draw them too. Analyze the list to see if there are any similarities. Take the first letter and form a story or an easy to remember silly acronym. The sillier something is, the easier it is to remember!